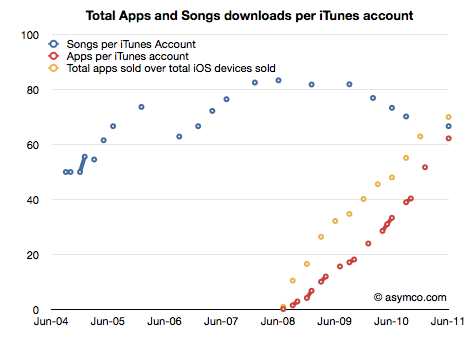 With flat music sales and booming app ecosystem, iOS app revenue should zoom past song sales by 2015 the latest. By one estimate, iOS developers and record labels together have pulled some $16.6 billion in cumulative revenues on Apple’s iTunes content store since its inception, according to an interesting analysis by Asymco’s Horace Dediu. Even if it involves a lot of guesswork and peering inside the crystal ball, the author’s thinking is determined by known iTunes milestones and revenue data from Apple’s quarterly findings. 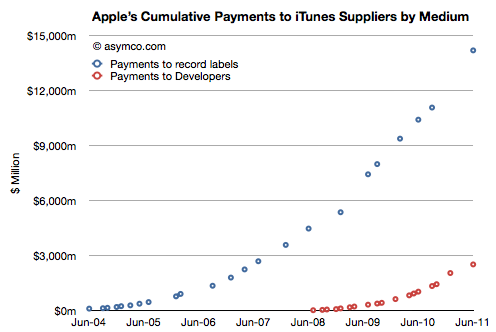 For example, Steve Jobs told us at WWDC 2011 that Apple so far paid out $2.5 billion to app developers. The combined “sales rate” is a remarkable $665 million per month. By the slope of the trend lines, it would appear that app income will exceed music income within three years. Another perspective is the number of downloads per device per month. This shows that the rate of consumption of apps is increasing and is now about six apps per device per month. App sales don’t take into account Mac App Store, which will help drive digital software sales up when Lion is released with Mac App Store built-in. That, and the fact that the Mac App Store carries items several times more expensive than iOS apps on App Store. Also, that music sales cumulatively eclipse app revenue by the factor of five is no surprise. After all, we’re only three years in with the App Store while iTunes has been selling music for far longer, since April 28, 2003. That said, total iTunes revenue is certainly higher than the $16.6 billion for combined app+music sales because Dediu’s analysis does not take take into account other revenue drivers such as sales of e-books, movies and television shows.